Synopsis: Are you fed up with seeing hats, gloves, scarves and coats left to one side even in the depths of winter? How many times have you found yourself uttering the words: You ll catch your death of cold? Well, here s our advice you need to read Chilly Billy Winters to your little horrors to teach them a cold, hard lesson. This is the exciting story of a little boy who ignores his Mum s repeated warnings to wrap up warm. He thinks vests and woolly jumpers are for wimps but he pays the price when he s kidnapped by a scary gang of zombie snowmen who fly him to a castle guarded by polar bears on ice skates. Billy discovers that the castle is the home of the evil Jack Frost and he finds himself locked away as a prisoner in the castle s freezing cold tower. There seems no escape but, just like all the other Monstrous Morals characters Fartin Martin Sidebottom, Black-toothed Ruth Black, Nose Picking Nicholas Pickering, Messy Bessie Clutterbuck, Fidgety Bridget Wrigglesworth, and Daydreaming Daisy McCloud Chilly Billy Winters somehow finds a way back home. Primary school age children, along with their parents and teachers, are taken on a magical journey which teaches them a monstrous lesson but leaves them with a warm feeling inside." About the Author&colon; As well as being a children's author, Peter Barron MBE is a journalist with 36 years' experience - 20 of them as an editor. He is also a father-of-four, so he knows all about children's bad habits. 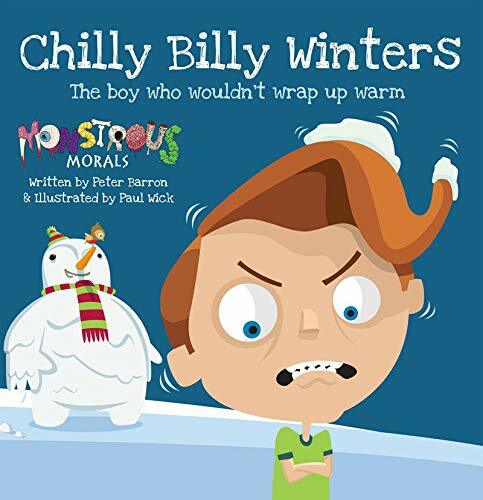 Chilly Billy Winters is the seventh book in the Monstrous Morals series and Peter has already written another six, so the fun is sure to continue for years to come.